The builders are asking me to outline just where I would like the garden beds to go on our block. Already? I thought to myself. Before the house has even started and before the final plans for the house are even drawn, I have to envisage and draw up a garden plan. Not the easiest request to fulfill. But this is the process of construction that we follow. So I comply. Here is my rough sketch. We have saline soil, it is also a silty clay, and it is reactive, meaning it is prone to movement – the ‘triple bunger’ of worst soils. Fantastic! Not really. Even sandy soils would have been easier to deal with, I think. But the soil tests don’t lie. What kind of Garden do I want? A retaining wall or raised garden to improve drainage as the soil will become easily water logged. A climbing plant espaliered along the fence? What plants would like to grow in poorly drained salty clay soil? Lavender bushes will grow by the coast and will also tolerate salty soils, but need good drainage and thus a sandy soil. (which I don’t have). So they would have to grow in pots. Perhaps I could grow some Bamboo in pots as a screening plant/informal hedge? “..most productive plants require good drainage and soil that’s well cultivated to about 30cm depth for good root growth and development, beans and shallow-rooted vegetables such as loose-leaf lettuce can be grown in clay soil. And then there is some ornamental species such as Day-lilies and Hydrangeas that like clay. 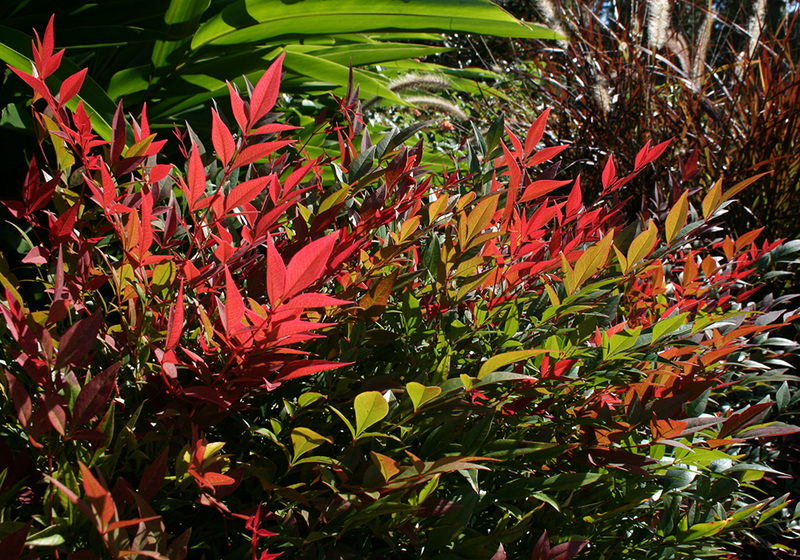 Nandinas are also very tolerant of clay soils and there are loads to choose from. As clay soils can tend to water log easily, care should be taken with garden design to allow for good drainage. Few plants are tolerant of water logged soils. If I lay down a good layer of loam on top, some ground covers might thrive as long as their roots do not become water logged. I can also improve the soil with compost and organic matter to aerate the clay, but it still is salty. There are not that many garden plants that tolerate salty soil in high concentrations. Prickly Pear Cactus – Seriously? – This is a pest that threatened to overtake farmland in the nineteenth century. Why would anyone want this in their yard? A definite NO. Flowering native shrubs such as the Bottle-brushes, Melaleucas, might do okay in moderate clay whilst two Banksias: spinulosa and ericifolia are apparently very tolerant of clay. Even a Westringia might cope and they are a coastal plant. Sounding better. Lomandras and Dianellas are tolerant of all but the heaviest clay soils. Some sites recommend the ornamental grasses such as Pennisetem, for heavy clay soils, but as I am highly allergic to grass, perhaps I should forget about that species. I think the iconic Australian native plants prefer free draining soils, and will struggle in clay soils without some soil improvement. Yareena™ Myoporum parvifolium is a native ground cover tolerant of a heavy clay. That might be useful. But sourcing this could be a problem. The Native hibiscus might survive and Lilly Pillies are reliable for hedges or screens in clay soils. There seems to be hope that there will be plenty of plants that might grow successfully in my salty clay garden. Something I’ll Ponder About. More things to research. Do you have any suggestions for me? Bolstered by the large and eventful breakfast, which I wrote about here, and visiting Tokyo in Crimson Leaves Season, we were keen to explore a traditional garden, on our first day in Japan. At the top of our list was the Gyoen National Garden, a green oasis that is completely amidst the busiest commercial district in Shinjuku, Tokyo. Originally a residence for one of Japan’s feudal Lord during the Edo period, the Gyoen National Garden fell under the control of the Imperial family in the twentieth century. Although much of the garden was then destroyed during World War II; you would never know it, as Gyoen is nothing short of a tranquil, well tended masterpiece of Japanese horticulture. With the NTT Docomo building towering stoically above Gyoen’s tree line like an old world Imperial Guard, it is easy to remember the Shinjuku-Shibuya metropolis is never far away. However, the hard concrete lines of modernity are significantly softened by the more natural lines of the leafy foliage and traditional Japanese garden fixtures. The Gyoen Guide Map offers us the chance to fully comprehend the scale of the park and orientates ourselves to ensure we see all the individual gardens and differing botanical features contained therein. Entrance, (with guide map in English), costs 200 Japanese Yen. We don’t want to miss anything! The small fee we pay to enter the garden is truly value for money, as the day we visit there is also a special floral display of cultivated chrysanthemums, which attracts the attention of many Japanese citizens. Light rain only enhances the organic beauty around us, as the raindrops linger on the leaves. This delights my daughter as it makes for excellent photographic opportunities. And we have the ubiquitous, clear-plastic umbrella to shield us. Very Japanese. One small Maple tree showed its Crimson coat. In a few weeks time, the others would too. Our arrival is a week or so early to see the majority of crimson leaves in Tokyo, for the temperatures are unusually warm. Despite this, I find the trees are magical and remind me of a medieval Northern forest, or a scene from a Lord of the Rings novel. The leaves are still golden and green, but soon to be crimson red. Each path within the garden invites in us, a different mood, vista and experience. You can see hanging bouquets of chrysanthemums in the display in the background. Despite the overcast conditions, the Pavilion was a place of tranquility and reflection, in more ways than one. No Japanese garden could be complete without a Carp pond – and Gyoen has one. Again the city reminds you it’s not far too away. A serene spot to reflect, meditate and rejuvenate in Gyoen. Lucky Carp fish. However, for this sub-tropical Australian resident, the ultimate heavenly experience is yet to come when I discover the avenue of Sycamore trees, a feast for local photographers. It is such a delight for me. I truly am in awe of these trees and their burst of colour. What photographer wouldn’t want to capture this? This is Autumnal earth, resplendent in shades of sienna, brown, rust, bright yellow and green, all coalescing in an intense and harmonious collection of wholesome organic beauty. The child in me wanted to run and kick up the fallen leaves, throw them in the air, rake them into a pile and jump on top of them. An Autumnal experience that exists only in my dreams. Reluctantly, after several hours exploring and a gazillion photographs taken, we walk towards the park’s Sendagaya gate and find yet another magical path through the trees. There is a special light through here. It is hard to define and see in the photo, but it is there.